You have benefits as a member of CruiseCompete. Don't leave them on the table. Take a look at your benefits, and explore the site even further to get the most out of your CruiseCompete membership! To see member benefits, click here. Click here to find available excursions, or call 1-866-578-7508 or 954-449-6309 for expert advice to help select the best excursions for you. The mid-size and big ships are best for couples, families, multi-generational groups and singles who enjoy an active environment and want many itinerary choices. For mature travelers who want a small-ship experience with few children, longer itineraries and off-the-beaten path ports, the Ocean Princess and Pacific Princess are good choices. A good slogan for Princess might be: "Have it Your Way," for the line has a fleet of different style ships, sails itineraries all over the world -- and successfully blends traditional cruise elements with more modern amenities. For example, the line has set seating – and also offers "Anytime Dining." The entertainment mix includes traditional Vegas-style revues, talent shows and comedians -- and also the newer "Movies Under the Stars." The dining mix (varies by ship) might include a New Orleans-style cafe or an Italian restaurant. The three-deck Piazza, a relatively new feature that's being expanded to older ships, includes a 24-hour cafe, a wine bar and Alfredo's pizza, as well as shops and a performance venue. Princess ships have casinos, nightclubs, discos and kids' clubs. All have Lotus spas and fitness centers that offer yoga and other classes. Some spas feature alternative therapies like acupuncture; the newer ones have such medi-spa options like Botox and other fillers. Depending on the ship, activities might include art auctions and all kinds of classes (some carry a fee): computer technology, photography, ceramics or cooking. 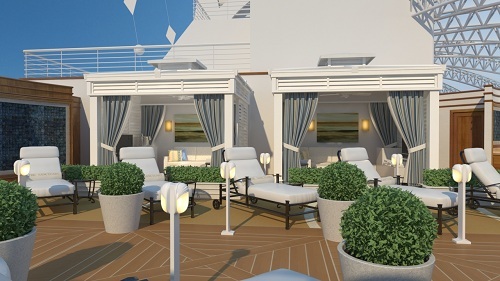 The newest (Royal Class) ships have expanded Piazzas, SeaWalks (glass-enclosed walkway) and Princess Live! (interactive TV studio). 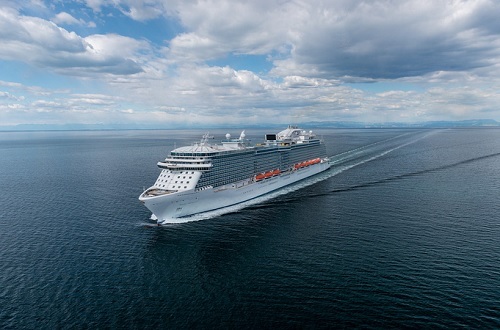 Princess cruises include both formal nights (one for seven-to-13-night trips) and smart casual nights. Formal means a tuxedo or dark suit for men and gowns, cocktail dresses or fancy pants suit for women. Smart Casual means pants and open neck shirts for men and dresses; skirts or slacks and sweaters or blouses for women. T shirts, shorts and halter tops are not allowed in the dining. Shoes must be worn in the dining rooms. Back in "the old days" of cruising, friends and family were allowed to come aboard with passengers, perhaps to share some champagne and small treats before the sailing time. That sweet custom ended, but Princess revived it with the "Bon Voyage" experience, which allows guests to come aboard for a tour and lunch with wine. Depending on the ship, fellow passengers can include family groups, couples, singles or mature travelers. On the big or mid-size ships, you'll find the broadest mix. The two smaller ships – Ocean Princess and Pacific Princess – have fewer features that appeal to families and sail longer itineraries to more exotic ports, so they attract older travelers. The minimum passenger age is 6 months on Alaska, Canada/New England, Caribbean, Europe, Mexico, Trans-canal and Australia/New Zealand cruises, and 12 months on all other cruises, including transatlantic and transpacific itineraries. Children under the age of 3 are welcome to visit the Youth Center, if accompanied and supervised by a parent at all times. All vessels, with the exception of the Ocean and Pacific Princess, have dedicated Youth Centers and Teen Lounges. These two vessels offer youth programs when 20 or more children, ages 3-17, are traveling on a given voyage. Children under the age of 3 are welcome to visit the Youth Center, if accompanied and supervised by a parent at all times. 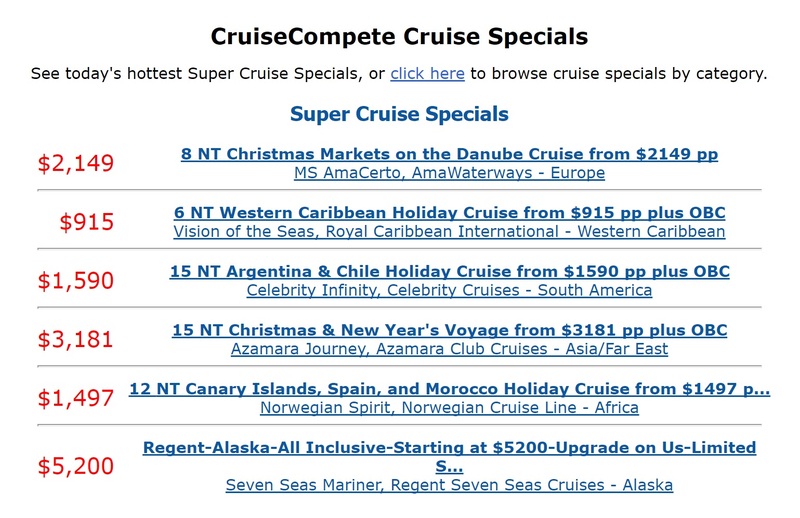 See all Princess Cruises Specials. CruiseCompete member-agents are the most well-educated, forward-thinking and trusted cruise specialists in the industry. If you’d like more information or assistance planning a future cruise, please visit CruiseCompete.com. To see consumer feedback click here.